Presented in excellent condition throughout, this delightful four bedroom home is situated in this popular village location and boasts views over open countryside. 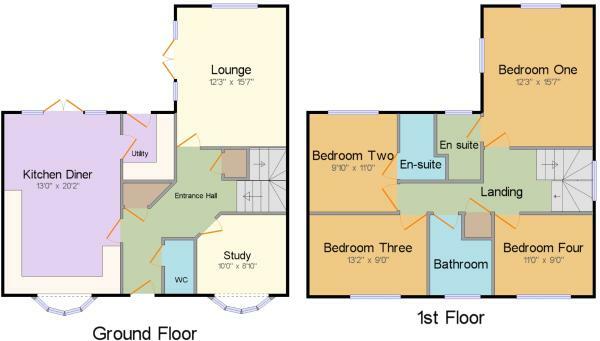 The accommodation in brief comprises of entrance hall, cloakroom, lounge, kitchen/dining room, study, utility room, first floor landing, two en suite bedrooms, bathroom, gardens and garage. Via door leading to entrance hall with stairs rising to first floor landing, radiator and built in cupboard. Doors to the following rooms. WC with low level flush, wall mounted wash hand basin,, extractor fan, radiator, tiled to splash back areas. Dual aspect windows to rear and side aspects, double doors opening out on to rear garden, radiator, TV/FM points. Radiator, phone point, window to front aspect. Single stainless steel sink and drainer with cupboard under, further range of fully fitted base and eye level units, granite work surface with tiled surround, integrated dish washer and fridge/freezer, tiled flooring, doors opening out on to the rear garden, radiator, concealed wall mounted boiler, door to utility room, window to front aspect. One and a half stainless steel sink and drainer with cupboard under, roll top work surface with tiled surround, integrated washing machine, tiled flooring, door to rear garden. Dual aspect windows to side and rear, radiator, door to en suite. Shower cubicle and wall mounted fitted shower, WC with low level flush, pedestal wash hand basin, tiled to splash back areas, heated towel rail. Window to rear aspect, radiator, door to en suite. Three piece fitted to comprise of panel bath with shower over, WC with low level flush, pedestal wash hand basin, tiled to splash back areas, frosted window to front aspect, heated towel rail. Laid to lawn with flower and shrub borders, paved to front access, driveway alongside providing off road parking and leading to single garage. Laid to lawn with paved patio to rear, wall mounted tap and panel fence surround. Disclaimer - Property reference MSS180114. The information displayed about this property comprises a property advertisement. Rightmove.co.uk makes no warranty as to the accuracy or completeness of the advertisement or any linked or associated information, and Rightmove has no control over the content. This property advertisement does not constitute property particulars. The information is provided and maintained by Taylors Estate Agents, Stony Stratford. Please contact the selling agent or developer directly to obtain any information which may be available under the terms of The Energy Performance of Buildings (Certificates and Inspections) (England and Wales) Regulations 2007 or the Home Report if in relation to a residential property in Scotland.